Tucker Smith Hand Signed Limited Canvas Giclee:"The Head of Pine Rock"
Edition: Artist Handsigned and Numbered, Limited to 75 Canvas Editions with COA. 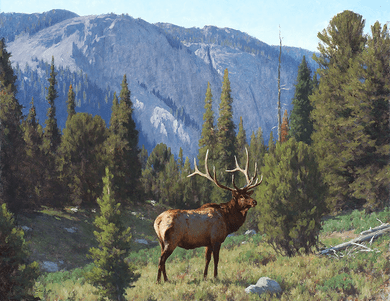 About the Artist: Well known as a nature and wildlife artist, Tucker Smith was born in 1940 in St. Paul, Minnesota. In 1952 he and his family moved to Pinedale, Wyoming. Tucker graduated from Pinedale High School in 1958 and received a B.S. degree from the University of Wyoming in 1963, with a major in mathematics and a minor in art. After working eight years as a computer programmer and systems analyst for the State of Montana, he began painting full time in 1971. Tucker and his wife, Jean, returned to live on the Hoback Rim, 30 miles north of Pinedale, Wyoming in 1993. Their home is at the foot of the Wind River Mountains from which he draws inspiration.